Five floor plans at The Ridge at Finn Hill range in size from 2,433 to 2,933 square feet. The homes at The Ridge at Finn Hill come standard with a heat pump, Fisher & Paykel appliance package, irrigated landscaped yards, Huntwood cabinets, and wiring for smart-home capabilities. 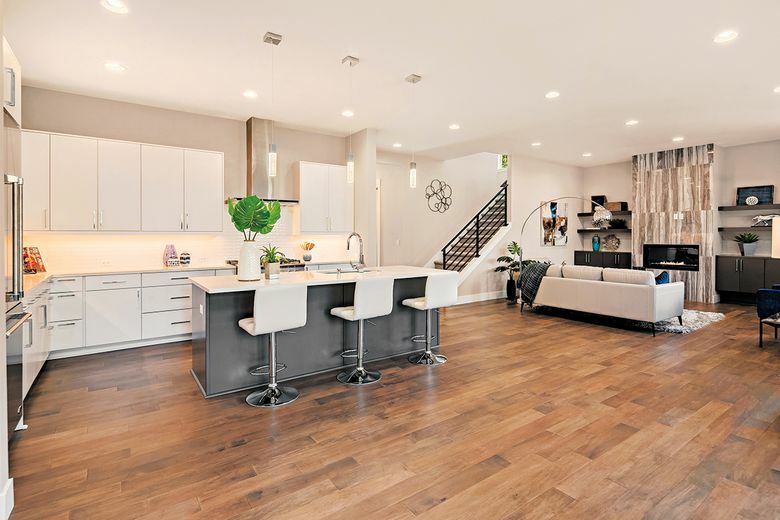 KIRKLAND — Two homes are available for immediate move-in at The Ridge at Finn Hill, a new Hultquist Homes development where all the builder upgrades that usually cost extra are already included. The Ridge at Finn Hill features 11 uniquely designed homes in five different designs, ranging in size from 2,433 to 2,933 square feet. All come standard with a heat pump, Fisher & Paykel appliance package, irrigated landscaped yards, Huntwood cabinets, and wiring for smart-home capabilities. Every home in the neighborhood includes a fully fenced yard and offers its own unique feel. In the 2,637-square-foot model home, exacting rooflines and angles define the façade’s modern architecture. Equally contemporary interior amenities showcase the sleek six-burner range, chimney hood and integrated French door refrigerator. Under-cabinet lighting beneath warm Huntwood custom cabinets illuminates gleaming quartz countertops while the artfully accented tile backsplash perfects this gourmet kitchen. The generous great room with floor-to-ceiling tiled fireplace warms the adjacent dining space featuring custom built-in buffet cabinetry. The main-floor guest room with adjoining bath is sure to be the privacy your guests are seeking. Indulgent finishes grace the master bath’s large tile-surround shower, dual sink quartz vanity and free-standing soaking tub. Separate walk-in closets bookend this suite for double wardrobes. Other wonderful features of this home include a large laundry room with custom cabinetry and deep sink, front and back yard landscaping with full irrigation, gas barbecue stub on the rear outdoor covered patio, and full heat pump. Hultquist Homes is offering eight move-in-ready homes throughout King County, including three homes in Auburn’s Willow Place that include rambler floor plans with bonus rooms. Hultquist is also offering two homes in Brooktree Estates in Carnation that include oversized garages, and one home in The Reserve at Finn Hill that features a generous lot size surrounded by community open space.